This map of the New Jersey State Assembly ranks districts by their partisan competitiveness, as calculated by EveryDistrict. Democrats know how to win big in Jersey. Just two years ago, Democrats took their largest majority in the State Assembly in nearly 40 years after Democratic challengers brought down four Republican incumbents. Meanwhile, Democrats also continue to command a solid majority in the State Senate, making New Jersey one of just 14 states where Democrats control both chambers of the state legislature. With these majorities, state legislators have pushed key Democratic policy priorities in Trenton. They’ve led efforts to pass a higher minimum wage, expanded family leave, and common-sense gun reform. Democratic lawmakers in New Jersey have made a splash on the national stage too, passing the country’s first bill to require future presidential candidates to release their tax returns before getting on the state’s ballot. In 2017 all 120 seats in the Legislature are up for election in November, and Democrats need to win big again. With a new governor due to take office, a strong, Democratic state house could be the difference between years of progress and years of stalemate. Lately, Washington has been moving backward, when it’s even been moving at all. Now more than ever, we need to defend our already-strong majorities in both chambers of the New Jersey Legislature so our state lawmakers can enact the kind of progressive agenda that’s stalled in the nation’s capital and advance policies that will help middle-and working-class families in New Jersey get ahead. But that’s not all. There is a path for Democrats to actually strengthen their control of the State House by adding to these majorities in the Assembly and Senate. This November, Democrats have the chance to push Republicans out of office in key battleground districts where Hillary Clinton won in 2016. 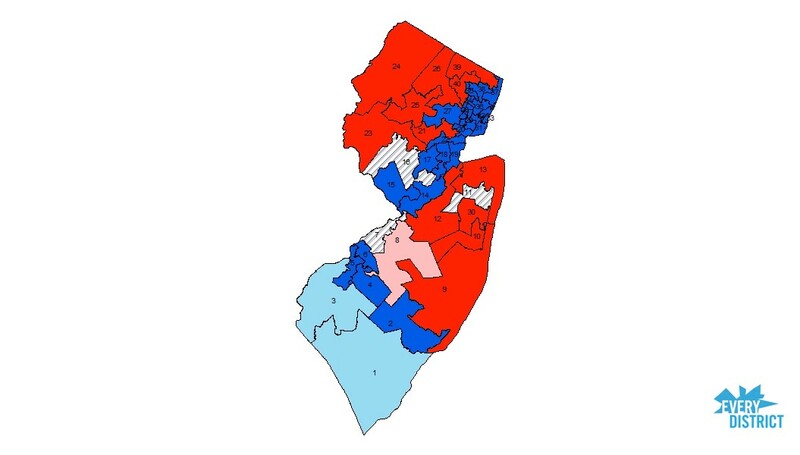 Winning in these Republican-held districts in the first general election since November 2016 would give Democrats an even greater opportunity to pass progressive policies in New Jersey, challenging backward-looking moves in Washington and sending a clear message about Democrats’ ability to run competitively at the state level. This is the best opportunity Democrats have had in almost a decade to enact their agenda in Trenton. Since 2010, a Republican governor you may have seen in the news, or in a meme, has been all too happy to wield his veto pen and stand in the way of overdue reforms. In fact, every one of the progressive policies mentioned above — higher minimum wage, more generous family leave, sensible gun measures — was passed by Democrats in the Legislature but ultimately vetoed by the governor. Fortunately, he’s on his way out. This makes electing strong Democratic majorities this November especially important. If the next governor is a Democrat, sending Democratic majorities back to Trenton would give us a totally Democratic-controlled state government and leave us with all the pieces we need to make Democrats’ policy agenda a reality. With Democrats in the governor’s mansion and the State House, we could finally pass the laws we need to do something about lackluster economic growth and widening income and wealth inequality. We could also do our fair share to reduce harmful emissions after years of denial. New Jersey could be at the forefront of progressive policymaking at the state level just as the current leadership in Washington makes state action even more important. On the other hand, if the next governor is a Republican, Democratic majorities in the Legislature would be necessary as a bulwark against dangerous Republican policymaking in Trenton. Plus, if Democrats add enough seats, they could even secure veto-proof supermajorities. Either way, this is a pivotal campaign for New Jersey’s future, and we can’t lose focus on winning in the Legislature even as an incredibly important race is underway for the governorship. This map of the New Jersey State Senate ranks districts by their partisan competitiveness, as calculated by EveryDistrict. Blue districts consistently vote for Democrats and are held by Democrats; red districts consistently vote for Republicans and are held by Republicans. Light blue districts lean Republican and are currently held by Democrats; light red districts lean Republican and are currently held by Republicans. Striped districts lean Democratic but are currently held by Republicans — these represent top pick up opportunities for Democrats. Already controlling a 24–16 majority in the State Senate, Democrats have a real chance to pick up additional seats in places where Hillary Clinton won in 2016. In fact, Clinton won six districts currently represented by Republicans in the Senate. Among those six districts, three of them (the 7th, 11th, and 16th legislative districts) have consistently supported Democrats over the last few years in statewide and national elections. The 7th district is an especially promising race for Democrats, given that Clinton won the district by 26 points and the Republican incumbent is not on the ballot. Democrats will also have to work hard to hold onto Senate seats they already control. 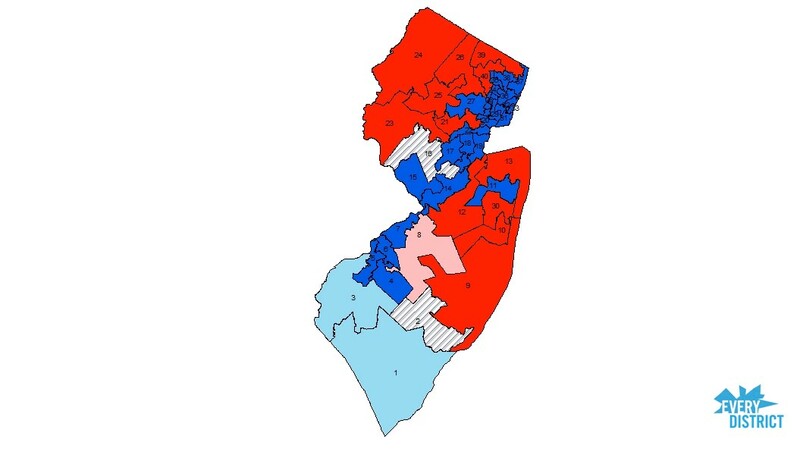 The 1st and 2nd legislative districts, located in South Jersey, are races Democrats need to pay particular attention to. Donald Trump won by 9 points in the 1st, while the 2nd district, which has an open seat, has been more competitive than most in recent statewide and national elections. Democrats will also need to focus on the races in Central Jersey’s 14th district and North Jersey’s 38th district. The Democratic incumbents there won their last elections by relatively slim margins and represent generally more competitive districts. This map of the New Jersey State Assembly ranks districts by their partisan competitiveness, as calculated by EveryDistrict. Blue districts consistently vote for Democrats and are held by Democrats; red districts consistently vote for Republicans and are held by Republicans. Light blue districts lean Republican and are currently held by Democrats; light red districts lean Republican and are currently held by Republicans. Striped districts lean Democratic but are currently held by Republicans — these represent top pick up opportunities for Democrats. Over in the Assembly, Democrats now hold 52 of 80 seats. Like in the Senate, there are some realistic opportunities for pickups this fall. Eight Republican Assemblymen and women currently occupy seats in districts won by Clinton last November. Two seats in particular stand out. The 2nd and 16th districts are each currently represented by one Republican and one Democrat in the Assembly. This November, the Republican incumbent in each district will not be running for re-election, giving Democrats a real chance to make gains in more competitive districts that very comfortably went to Clinton last year. Like in the Senate, Democrats will have to make a big push to defend seats in their Assembly majority. While the 1st and 3rd districts are currently represented by two Democrats a piece, Trump won both of these areas last November. Democrats also only just picked up one of those seats in the 1st district in 2015. Over the last few months, Democratic voters and activists across the country have worked tirelessly to win state-level races, even those in traditionally Republican districts. New Jersey, like Virginia, gives us our first opportunity since November 2016 to harness this energy in a general election. Defending our powerful Democratic majorities and picking up extra seats currently held by Republicans could allow Democratic legislators to unleash a wave of progressive policymaking in Trenton. It would also send a pretty powerful message to Washington and across the country about the strength of the Democrats’ agenda and our ability to run competitive races across the board. Sign up for EveryDistrict’s email list here, and we will keep you updated on the state races coming up in New Jersey and Virginia in November. With your help, we can win all over the Garden State.